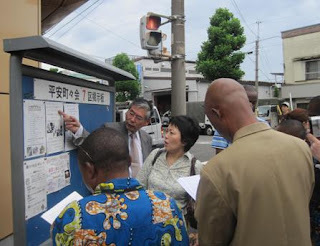 On Wednesday July 9, five officials of local government in Democratic Republic of Congo visited a small urban community in Yokohama city, Kanagawa Prefecture. They came to Japan to participate in JICA Tokyo training course “Promotion of Urban Community Development in the DR Congo”. The training course aims at providing opportunities for the participants to acquire necessary knowledge and skills to promote participatory sustainable community development through learning from Japanese experience. 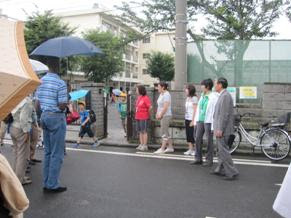 In order to study community-based voluntary activities in urban area and their relationship with local government, a field visit to an urban community where residents are actively involved in various development activities was arranged, and “Heian-cho chokai” was selected to be visited as a field work. Heian-cho is a residential area inside Yokohama city (one of the largest port cities in Japan) with total 3,500 households living near “Tsurumi-ichiba” station of Keikyu railway. The residents can reach Tokyo city center within 40 minutes if they take Keikyu line, and it takes only 16 minutes ride on a train to arrive at Yokohama station where you can find variety of shopping and amusement facilities. Recently, several high-rise apartment buildings were constructed, so the number of younger families and unmarried people increased in the area, whereas among the old residents there increased aged population as their sons and daughters had grown up and live separately outside the area. In short, Heian-cho is one of the ordinary residential towns around Tokyo with a mixture of new young comers and old residents of aged families. In Japan, at most of residential areas, neighborhood associations (chonai-kai, chokai, or jichi-kai in Japanese words) are organized among the residents. The neighborhood associations in Japan are basically voluntary organizations spontaneously established by the residents to implement community activities such as disaster preparedness, crime prevention, welfare activities, and mutual friendship events. Throughout Japan, there said to be around three hundred thousand neighborhood associations. Some of them are active, but others are not so. 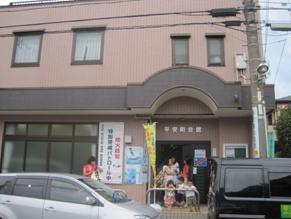 Especially in the city area such as Yokohama or Tokyo, as most of the residents are so busy in their own business or family matters, and human relationship among the community members become much weakened as a result, many neighborhood associations can not attract most of their residents to the activities, and have become less active. However, it is not the case of Heian-cho chokai. The association is still much active to implement various social activities and many residents participate actively in those activities and events. It has 2,800 households as members, and it is divided into eight issue-wise divisions and 15 area-wise sections. 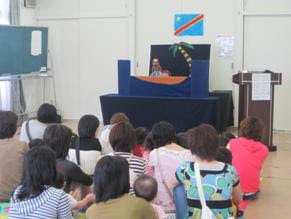 Firstly, the training participants from DR Congo were welcomed by children and their mothers who gathered at a community center in Heian-cho. They came to the facility several times in a month to participate in various games, exercises, and plays organized by volunteer instructors. This “Heian Kids Room” is organized by the Chokai aiming at providing opportunities for young mothers and children to have interactions among each others. In the busy urban life, the mothers (housewives) have not enough chance to meet their neighbors and to talk each other. 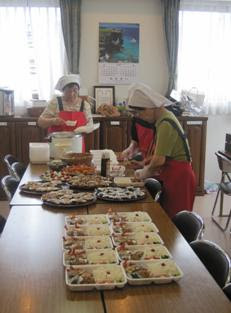 Then, the participants observed lunch delivery activity of “Heian-cho Fukushi Sanjokai” (Welfare Supporting Association). This program is designed to provide healthy lunch for elderly residents who live alone in the community. All the staff involved in cooking and delivering lunch box are volunteers from the community. The participants observed how they cooked lunch boxes and deliver them to each elderly resident by motorbike. This activity is implemented once a week, and it gives good opportunity for the community people to meet elderly residents who live alone and have little chance to interact with the other community members. In addition to those activities, the training participants also observed “patrolling activity” for school children also organized by the Heian-cho Chokai (neighborhood association). When classes of a primary school in the community finish in the afternoon, volunteers from the community gathered at several places near the school such as the school gates and crossings. The volunteers watched the school children coming back home, and they often talked with the children. This activity is primarily aimed at protecting school children from traffic accidents or violent crimes, but at the same time, it creates good chance for the community members to interact with the children. After observing various activities of the Chokai, a leader of the association, Mr. H.Kasai delivered a lecture on the background and strategy of the association. According to Mr. Kasai, the ultimate goal of various activities of Chokai is to create and maintain a community living with safe environment without worries. The activities of association can be categorized as welfare for the elderly, services for the children and parents, security, disaster preparedness, cultural and sports events, protecting environment, and mutual helping activities among youth, women, and elderly people. Mr. Kasai emphasized importance of voluntary actions. All the above activities of the community were initiated by the community members themselves. The community people who gathered in the association discussed among them and found out what was necessary for them to protect and improve their everyday life. Mr. Kasai facilitated the process and asked the other community members to take responsibility for each activity initiated and planned by the members. Of course, some of the activities such as lunch delivery, disaster preparedness, and security (crime prevention) are supported and subsidized by local administration. The Yokohama city government provides subsidy and grant to such community activities. However, what Mr. Kasai emphasized is that it is the Heian-cho community itself that initiated the activities and asked support to the local administration, and he also strongly claimed that the local government should not ask the community associations to help its projects, instead, the local government should help the projects created by community associations. -There is a place for children’s recreation, and the children who visited there are very active and relaxed. -In the lunch box delivered to elderly residents by the association, there was a message sheet from the other residents. It is a good tool for communication. -During the World War II, the community was totally destroyed by bombing, but the residents and local administration worked together to recover and re-construct. 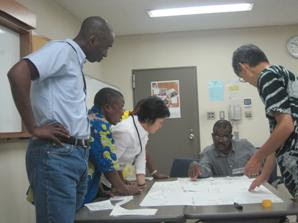 -Various activities implemented by Chokai provide important opportunities for the residents to communicate each other. -There is a network among stakeholders to protect children from crimes and accidents. -Voluntary spirits among the community members are very strong. -The residents are conscious about importance of reducing and recycling garbages. -There is a good coordination and collaboration between local community and local administration. Then, the participants tried to draw out learning from which they will be able to utilize in their own activities at home. -In Congo, there are community groups organized by ordinary people. They implement activities based on subsidy and donation. The problem is that if their funding source stops support, most of their activities can also stop. It is very important that community-based organizations or groups should mobilize existing local resources including human volunteer powers. -By observing various activities of Heian-cho Chokai, a question comes into my mind. “What are the roles of local government?” In Heian-cho, some of the activities that should be managed by local administration are also implemented by the community people (Chokai). We need to think about what should be planned and implemented by local government and what should be planned and implemented by local communities. As a leader of community association, I strongly feel that only a one leader can not achieve even a single activity for the community. Community can grow gradually as if a tree accumulates annual ring. You should not expect an immediate instant success. You observed community members who talked with an old woman who received lunch delivery, or who exchanged greetings with children coming back from school. It is such a small effort to accumulate human interactions in everyday life that will lead to achieving better community. There is a flower bed in a park of this community. Some volunteers maintain the flower bed regularly, and those volunteers are called “Hanasukikai”. The word “Hanasukikai” has two meanings, “we love flowers” and “opportunity to talk together”. We hope that the community members see beautiful flowers, exchange greetings, and talk each other, and as a result, our community tie becomes much stronger. In your communities in Congo, if local people communicate each other more actively through community activities, I believe that your communities will also become stronger.